The sun crept lazily over the horizon, bathing the tall towers of Illikon in its light. Below, the city was stirring to life, slowly shaking off the night. If one were to watch the city transition from night to day they would witness the transformation in all its splendor. The night owls of the city crawled back to their holes to sleep while the markets and streets began to buzz with activity. Merchants opened their stalls and bakers began to make their rounds. City guards changed posts while thieves retreated to their lairs. The city was coming to life and everyone was waking. Almost everyone. At the Silver Stein, Wilhelm’s snores were hard at work peeling the paint off the walls. After a long night of drinking and getting to know his crew, Wilhelm was oblivious to the world waking. However, his slumber did not last for too long. With a loud bang the bedroom was kicked in. Years of survival kicked in and Wilhelm leapt to his feet with a shout. He found himself staring into the cold grey eyes of his first mate. “By the gods Faelor!” Wilhelm snapped. He paused and held his head, a throbbing headache painfully reminding him of the activities from the night before. Gently rubbing his temples, he began to turn and walk back to his bed. However, the elf grabbed his arm to stop him and began to drag him towards the door. Wilhelm loudly protested and tried in vain to get back to his bed. “We are late captain,” Faelor explained in his usual monotonous voice. To most people the elf rarely showed any kind of emotion, preferring to keep reserved and expend as little energy in inflections as possible. In many ways, he was the polar opposite of his fiery-tempered captain. He suspected that was the reason Wilhelm chose him to be his first mate, his level-headed approach to the world helping keep Wilhelm from too much trouble. Sometimes. “What... What time is it?” Wilhelm murmured. He blinked slowly as his head threatened to explode. Faelor glanced out the window at the brightening sky. At the docks the motley crew had gathered on the deck of The Sun Chaser. The boards creaked beneath them as the ship bobbed gently on the water. The early morning breeze teased the sails with the promise of adventure. For a moment, the crew were wondering if the captain would even bother to show up. They stood about in silence, the world around the ship slowly getting busier and busier. “There they are!” came a high-pitched shout. From the crow’s nest Shauni spied the captain and first mate making their way to the ship. A sense of relief passed over the crew. At the very least they would be setting sail. Wilhelm leapt aboard the deck and surveyed his new crew. A smile spread from ear to ear as he greeted them. He went around taking their names, Faelor silently following behind him. After introductions were finished he climbed to the upper deck to address them. With the final shout, Wilhelm hopped down among the crew and began assigning tasks. The crew scurried about, lowering sails and preparing the ship. The old caravel groaned in protest as she left the dock and began to drift swiftly out of the harbor and onto the open sea. During the speech, Faelor had turned his attention to the piece of parchment in his pocket. It was the one he had used to take down the names of the new crew. He pulled it out and sighed quietly as he reviewed the names and began to think to the sort of desperation that led to hiring such a crew. He silently prayed to the gods that maybe they would live to tell this tale. The Roost. The Crow's Nest. The Lookout Tower. Atop the highest point of the mast, confined to essentially and oversized bucket, Shauni Sunchaser proudly manned her station. Since no other pirate had the stature (or desire) to work in such a solemn spot, the girl had essentially converted the nest into her little watching spot. There were tiny sacks filled with dried jerkies and sugared candies from the mainland. The insides had been used as canvas to draw: there were pictures of every original crew member plastered on the planks, with a more detailed version of Shauni and her best friend Basil drawn bigger than life. Shauni used her spyglass not to look out to sea but rather to spy on the newest additions onboard, casually drawing them on the few empty spots with colored sticks of wax. There was the white haired one, clinging to the taffrail, ready to vomit whenever the sea lurched their boat too violently. Her coattail would rapidly flap in the wind like the sails themselves to show off of her sword strapped to her rear. Shauni made sure to draw the sword in her picture, even though she hadn't seen her use it all. Her outfit didn't seem to provide her with pockets; where was she keeping her gear? Besides the Woman of White, there were a few more motley fellows: a sellsword encased in armor, with a crossbow twice the size of Shauni's. There was a fat man robed in furs, with gilded equipment: gold weapons and gold jewelry; she would steal what she could from him when he inevitably hibernated. Shauni doubled up on wax sticks when drawing his rotund body, enlarging it to comical proportions. There was a masked woman, sulking to herself - a complete mystery to the pirate child. Sunchaser doubled up on her colors to get the mask right, but it came to look more like a skull atop a nun's body. Oh well. There were also two more additions: a young lady with a gorgeous (and valuable) stringed-instrument and Faelor's gwandpa, the oldest man on board wrapped in multiple wolf furs. Thankfully they all had pockets and bags and satchels, ripe for disappearing when the time came to it. Now finished with her new gallery of crew members, Shauni extended her spyglass out to the open sea to look for any landmarks or problems. Thankfully it was open, rolling blue waves out to the horizon. Having met her quota for work, Shauni removed her cap to let her unruly orange hair catch some sunlight - as well as awaken the napping pixie nestled in her mane. "You had a good nap, Basil?" Even though he had anchored himself well enough, Shauni made sure not to tilt more than necessary to prevent him from tumbling out. She fetched a cube of peppermint from her miniature satchel and placed it on top of her head, next to sleeping Basil. "Wake up, sleepy baby. We gotta figure out who them slogs are." She felt Basil roll over, comfortably embedded in her tangles. Hot-headed and quick to get mad, Shauni whistled and began shaking her head. "GET UP YA GIT! I WANNA SEE THE NEW'UNS!" She groaned slightly. She'd been on ships before, but on rivers, and the experience had been pleasant. Very pleasant on the one occasion she'd been able to charm the captain and enjoyed the luxury of the nicest cabin on board. But the open sea seemed to have it in for her. She wiped her mouth with the back of her hand and leaned back from the railing, glancing at the crew around her. Everyone seemed occupied, and Adrienna was acutely aware that she wouldn't last long as crew if she didn't at least look busy. Although maybe the same tactic would work here as last time she was on a ship. it couldn't hurt to socialise. "It's a good, clear day" she proclaimed to nobody in particular. "Great weather to set sail." Internally Adrienna winced. Her grand charm offensive consisted of talking about the weather. She grabbed a nearby rag and set to work ineffectually swabbing the decks. Was the aim to get them wet or dry? She wasn't sure, but it was a visible indicator that she was Very Busy. Runi had taken it upon himself to make sure the meals on this ship were the best their supplies could make, so he was busy in the forecastle, sniffing around at various crates and marking things down on a bit of parchment. True, he couldn't actually read or write, so it only made the remotest sense to him, but it was still there. It helped him with taking stock of what they had so he could plan meals. The muscle-bound old warrior wasn't usually one to cook for an entire ship, but these days, he tried to be as helpful and friendly as he could. This seemed like a good place to start. Speaking of food, however, he heard the exact opposite going on somewhere else on the main deck. Someone was apparently seasick already, from the sound of it. Pricking up his ears, Runi exited the forecastle - closing the door behind him - and turned to Adrienna, arching a brow. He put away his bit of parchment and strode over to her, a friendly smile on his handsome face. It was friendly enough, at least, that someone might've been able to look past the fact that he was walking around with his hood up - his hood that was the head of the wolf pelt he wore on his back, fit with false eyes that gleamed in the sun. "If you'll pardon my saying so, you don't seem fit for swabbing the deck, milady. Might leave a mess where you were trying to clean up," said the old berserk. Let it never be said that, over the years, he didn't learn his Imperial manners. "Seems to me you should get yourself used to seafaring before you set to work. I'll happily swab the decks in your stead." He paused and said, "But where are my manners?" With a slight bow of cowled head, he said, "Runi, at your service." It was tough being a goddess. While Asuke was not the first to vomit on the Sun Chaser, she liked to think that she would be the last. While Adrienna was able to stop herself after vomiting a couple of times, Asuka had become bile incarnate, with a never ending stream of puke flowing out of her like a river whenever she opened her mouth. She liked to think that, as a new goddess, everything that came out of her was in and of itself a miracle. Perhaps the priests who would soon be worshiping her will eventually create a shrine to honor her stomach problems. Worse yet, vomiting as a dragon was weird. Not only did the gesture of puking her guts up feel very similar to breathing fire, but her body seemed to have way more food in it than seemed possible. That was because it did. In her dragon form, Asuka could eat a lot more than her traditional human self (dwarves were delicious), but when she vomited it came from her dragon stomach as opposed to her human one. She wasn't sure how that worked physically, but then again it wasn't really a dragon or goddess's place to bring up science. So, there she was, continuously coughing up miracles. "It's settled then. I hate boats." Asuka concluded that as part of the book she was writing about how amazing she was she would include as part of her commandments all bodies of water would be outlawed and would be evaporated on sight. It was the only sensible solution. At long last, after hacking up what seemed to resemble a viking's helmet, Asuka cleared her throat and concluded that she was done vomiting for the time being. With that, Asuka turned to face her motley crew and future worshipers. Despite looking like a young female samurai, Asuka was actually a dragon. While most dragons were content to relax in their caves and collect whatever trinkets they could get their claws on (she preferred pearls), Asuka wanted more out of life. In particular, after spending centuries taking stock of her pearl collection, Asuka concluded that being a dragon was lame. Having an amazing collection of pearls was only worthwhile if someone else thought it was amazing. And so, Asuka decided she would no longer be an ordinary dragon. She would be a goddess worshiped by all. But that brought up a dilemma: how does one become a goddess? Asuka assumed they were simply born into their roles, which was unfortunately not an option for her unless reincarnation turned out to be real (and she did not want to put that to the test). So, instead Asuka decided that she would simply declare that she was a goddess and see how it went. I mean, goddesses were mysterious and alluring right? She could pull that off! I mean, heck, she had white hair. 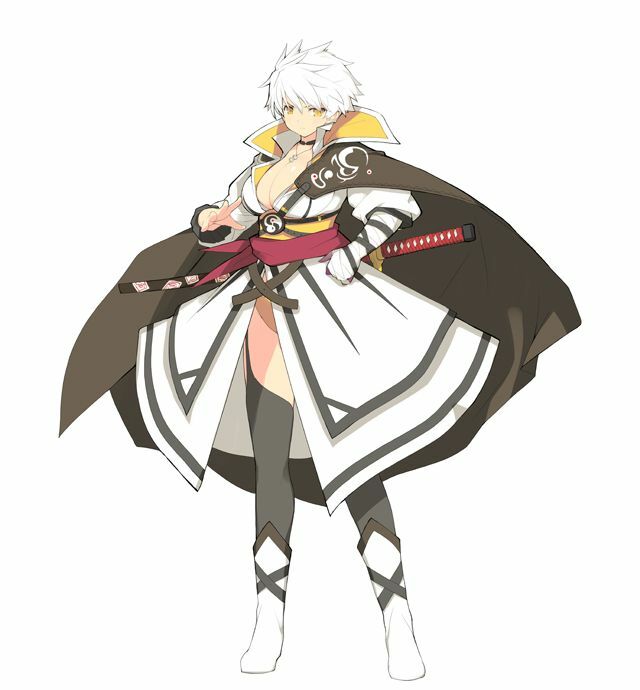 How many young female samurais had white hair? If that wasn't mysterious and alluring, she had no idea what was. The only reason she was on this ship in the first place was a bizarre social experiment. She was going to be stuck with a ragtag group of pirates and ne'er do wells on a ship for a long period of time in relative isolation. It was the perfect opportunity to start a cult dedicated to her. After all, if she could not get a group like this to worship her, how would she do with the rest of the world? But where would she start? She had to do something to impress the people. And so, Asuka walked up to the other puker and a muscular old man (Adrienna and Runi). "Hi guys. The name's Asuka." The dragon explained. "I once farted a thunderstorm. Isn't that amazing?" Sir Gisburn of Pikeston stood on the deck of the ship, breathing in the fresh, sea air, trying to ignore the multiple people vomiting over the side. His mind was elsewhere: he was going to the World's Edge! Who knew what new continents or races they would discover, just waiting to be exploited for riches and fame by him: the greatest...businessman to walk the face of the earth. The Nobleman looked at the more interesting members of the crew. They were conspirators, just waiting to be recruited. Gisburn stumped over to a growing group of crew members, a smile on his face that was sure to lull everyone into a false sense of security. "Hi guys. The name's Asuka. I once farted a thunderstorm. Isn't that amazing?" The Nobleman's face fell faster than a Northern Avalanche. He would be sailing to the Edge of the World...with a group of Idiots. "Well," he said carefully, trying not to offend the possibly insane woman "that's...interesting. Is that a common thing for people in the East to do...?" Brackenburn made no sound other than the periodic shriek of whetstone on his void falcion as he obsessively sharpened it, each draw of the stone calculated and methodical. He was clad only in simple boots, pants, and a greyed cloth shirt. His suit of armor, a mix of expertly crafted leather plates and armored plate, was stowed below with his gear, carefully wrapped in simple cloth sacks to protect against the salty wind. Not that they'd ever reach the hold but years at sea had taught the man one could never be too careful. He had left his crossbow so something occupied his hammock for the night down below. The bunk closest to the stairs out. Sleeping there was a force of survivalist habit. For a man of his calling and demeanor one would assume he'd find the darkest corner of the ship and crouch in the shadows, resigning himself to the comforting darkness. But Brackenburn the Black was actually quite fond of the sea-sprayed wind of the open sea and the gleaming sun smiling down on him. A murderer and hired killer he may be but even the most callous and violent of men found some natural joy in life. But as the wind billowed and buffeted the sails, there was no sign of any kind of happiness from the man. Brackenburn was lost in deep thought. His face was set in a scowl: Brows furrowed, frown deep. His eyes, curiously tinged yellow, were unfocused and cast down at the void-iron blade of his falchion, which he continued to sharpen, rotating the blade as he continued his work, completely lost in his own phantom world of thought. The others were aboard for adventure. For wealth. For discovery. There was only one reason why he was here and the reminder of it was clutched in the vice-like grip of his surprisingly large hands. He'd killed so many in his time. So, so many people. Not all of them warriors, not all of them soldiers. Struck, shot, beaten them down and never gave it another thought. But that wasn't why he had to flee. He had to flee because he'd saved someone. But it had come with the cost of an Inquisitor to save her. No good deed ever went unpunished in the worls. There was nowhere in civilization he could hide for forever, the End of the world was the only place he could go to escape their prying gaze and biting chains. A seagull cried out before taking flight, abandoning the ship to fly back to the port while it could. Brackenburn halted at the sound, blinking hard, his scowl softening as his world of inner thought scattered. He looked up at the blue sky and the gleaming sun as if for the first time that day. There was no reason to dwell on the Inquisition. Out here he was free. His gaze lowered back to his crewmates, most of them hurling their guts over the side. The scowl was back. Hopefully they'd reach some kind of land before they met pirates, or it'd be a very short-lived expedition. As interesting as the crew had seemed, Basil Shimmershore lacked Shauni’s attention span when it came to staring at people from far, far above. Even if some of them were, hilariously, vomiting all over the place. The pixie had entertained the idea of descending among them and getting a better look, but he had a feeling Shauni wouldn’t want him getting in her pictures. That, and wandering around on his own as dangerous. He’d learned that from experience. So, sooner than later, he’d squirmed under her cap and got comfortable amongst the human’s vibrant curls, swiftly dozing off. For being on such a rough and tough girl, Shauni’s hair was remarkably comfortable: better than any of the beds either of them had tried assembling for a little pixie like himself. Basil’s nose finally twitched as a cube of peppermint the size of his head was placed amidst Shauni’s curls, right next to his sleepy self. She finally had his interest. His relaxation lasted almost a second before Shauni whistled and began shaking her head wildly. Basil let out a squeaky yelp as he was quickly losing curly hairs to hold him down. However, that was the least of his concerns as the peppermint was quickly getting dislodged, eliciting a gasp from Shimmershore. "GET UP YA GIT! I WANNA SEE THE NEW'UNS!" Shauni shouted, drowning out any protesting Basil offered. And, with that, the mint was sent flying into the air. The pixie cried out, distraught, and loosened the last few hairs holding him in place. With all of Shauni’s head-shaking, the little fae was sent soaring into the air after the candy, and a bit of deft piloting helped him catch it as he dove out of sight - just below the rim of the crow’s nest. Hugging his prize close, Basil waited a few long moments for the human to realize what she’d down before he peeked up and over into the bucket-like spot. “I’m up, I’m up~...” He chimed sheepishly, pulling himself up with a flutter of butterfly wings and taking a seat on the rim of the crow’s nest. Basil carefully gnawed on the peppermint as he watched Shauni’s reaction. “Do I reeeaaally need ta be awake so you can see these new’uns, though?” He yawned, rubbing his eyes. “I just wanted a nap in yer comfy hair.” He finished with a slight pout. Well, this was sure going to be an interesting journey. She quickly shook such thoughts from her mind as she wandered the deck aimlessly. She’d been dictated a task, but for now she was more interested in sizing up the crew around her… and, well, most of them weren’t doing anything. In fact, one particularly well-endowed woman was busy announcing she could fart thunderstorms. As much as Tenebra wanted to laugh and call her crazy… well, maybe she wasn’t? In that moment, the demon-kin froze. W-wait, is she one of them? One of the Hidden? Paralyzed for a moment, Abdris tried to remind herself how ridiculous that could be. Sure, they were late in leaving, but the she was certain she’d thrown the Hidden off of her scent. Plus, while they tended to be rather crazy, they weren’t “HEY I’M MAGIC AND I FART MIRACLES” levels of insane. This idiot couldn’t possibly be one of them. But if you’re wrong, you’re dead. Or worse, a slave. That thought wouldn’t leave her alone, and it took a great deal of willpower for Tenebra to not hurl some magic at the eastern woman to try getting some reaction out of her. Instead, she went as far as she could go… which left her in Brackenburn’s company. Well, at least he wasn’t a crazy mage - even if he was, interestingly enough, sharpening a void iron blade. Yet he didn’t have the markings of an Inquisitor, despite seeming rather… well, like he could be one, void iron or no. He was a hell of a brute in build and demeanor, the kind who seemed used to bruising if not killing or torturing others. Tenebra let out a sigh as she took a seat nearby - not too close, but not beyond conversational distance - the killer, quickly getting comfortable against the ship’s rail. “Well, of all of us you look like you can actually handle yourself.” Abdris noted, sizing him up. Her voice was a little muffled by the mask she wore. “As much as I’d like to, I haven’t quite gotten the hang of swinging a sword…” Tenebra admitted, patting the handle of the mighty blade still sheathed at her side. While it might have been odd to the others, she wanted to be ready in case… well, anything happened. Granted, she was specifically more than a little worried about a Hidden ambush of some kind, but abrupt sea monster attacks were a problem, too, the demon-kin figured. Adrienna swabbed furiously, not entirely sure she was having any effect. She was so caught up she didn't notice Runi until he was close enough to touch. "If you'll pardon my saying so, you don't seem fit for swabbing the deck, milady. Might leave a mess where you were trying to clean up. Seems to me you should get yourself used to seafaring before you set to work. I'll happily swab the decks in your stead." Adrienna started slightly, before smiling internally. A charming gentleman was exactly what she needed at times like this. Time for an old trick. With a practised nonchalance, she turned her head and upper body, allowing her hair to cascade around her. She smiled in what she liked to think was a mysterious way, taking in the older man in front of her. "But where are my manners? Runi, at your service." "Adrienna." She stood smoothly, the rag and bucket entirely forgotten. "A pleasure to make your acquaintance." Behind the old warrior she spied another man walking over, a noble perhaps. His clothes certainly suggested it, as did the confidence in his walk. Adrienna winced. He looked just like the type of friends her father had constantly had around the estate. He may well have been one. The noble looked set to introduce himself but was beaten to it by a striking white haired woman. The nobleman said something, but Adrienna was too busy choking back a snort of laughter to pay much attention. Asuka was definitely going to be someone fun to drink with. She smiled in a slightly flirtatious manner and extended a hand. "Adrienna. That sounds like a fun skill." "Why not?" Brackenburn asked bluntly. He had a low, deep voice with a curious scratch to it, as if from a throat wound or too many years using a pipe. He nodded to the woman's mask and gear. "You seem a like a fighter to me. Few besides that could afford a sword like that." Adrienna smiled in a slightly flirtatious manner and extended a hand. "Adrienna. That sounds like a fun skill." What the heck is that human doing? Asuka thought as Adrienna extended her hand. The dragon took a quick step back as though the woman were about to strike her. Had her cover already been blown? Was this woman secretly a dragon hunter who had been hunting her since she started her journey? Asuka began sweating profusely. What was she going to do? Should she reveal her dragon form and try to devour this woman before she attacked? That was risky. Surely she had impressed the rest of the crew by revealing that she once pushed a thunderstorm out of her bowels, but it was unknown whether or not they would turn on her if she took on her true form. Asuka stopped herself. The woman had yet to attack. In fact, she was actually smiling in what Asuka could only assume was a flirtatious manner. What sort of game was this strange woman playing? Regardless, considering the fact that she was still alive, she did not seem to be hostile. That must be it. Extending the hand must be a traditional human gesture of heterosexual greeting. This woman did not want to kill her...at least, not yet. She could still salvage this situation! All she had to do was extend her own hand and grasp hers in return. It was so simple! Humans have the best hand gestures. But, what if it was more complicated than that? If I extend my hand, perhaps she will be insulted? It's impossible for me to know! I've never seen another human do anything like this before! Worse yet, if she returned her gesture, would she place herself on the same level of Adrienna? She could not afford to do that if she wanted to crown herself a goddess. She had to be above the common rabble! And for someone as extraordinary as herself, she had to greet the masses with a gesture unlike anything they had ever seen! A gesture worthy of a goddess! But what could she do? They both seemed to have a common interest in vomiting. Perhaps they could vomit into each other's mouth? All this overthinking caused Asuka to begin sweating profusely. Her heart felt like it was about to explode out of her chest. She had to do something! Wait, she remembered something back from when she originally emerged in the human world. She remembered seeing a pair of dogs greet each other in a very affectionate manner. And humans served dogs! So, if she wanted to be served by humans, she needed to use one of their gestures! And so, without further ado, Asuka hopped forward and licked Adrienna across the face. "Well met Adrienna! May our sharing of saliva seal our friendship for centuries, provided you humans live that long." She stumbled over her words a bit, but hopefully the human would be distracted by her sharing of fluids that she would fail to pay attention. "Well," Sir Gisburn said carefully, trying not to offend the possibly insane woman "that's...interesting. Is that a common thing for people in the East to do...?" Some fat merchant whose body was literally overflowing with fat hesitantly greeted her. He certainly lacked the confidence of the sultry female human. Probably because he was fat. Seriously, it was though he had been asked what he wanted for breakfast every day for a year and he always said "everything." She could generate herself ten extra human forms just from his excess mass. Yet, despite her initial disgust, Asuka found herself mesmerized by it as well. He jiggled like a jello bowl every time he made even the slightest movement. It was hypnotic in a strange way, and before she realized what she was doing, Asuka found herself staring. Asuka literally slapped herself to snap herself out of it. This fat man was no ordinary human. "Absolutely not, for you see I am not ordinary! Why, I would go so far as to say that I am exceptional! I, my fair fat man, am a goddess!" Asuka said, raising her hand high. "Please try to contain your enthusiasm. Instead, focus your energy instead into worshiping me. I will bring you all a lifetime of eternal happiness!" "And all I need in return is your unquestioning loyalty. So feel free to bow people!" She then pointed at the merchant. "You can just nod your head if bowing is too hard." “...I haven’t quite had time.” Tenebra admitted with a slight shrug, albeit she sounded faintly embarrassed. She glanced off to one side, quickly looking back to Brackenburn as someone got licked. By the gods we’re going to die if anything happens. “And, ah, I sort of picked this thing up on my way here.” She added quickly, trying to get the image of Asuka tasting someone out of her head. She didn’t recall one of the few times she’d used her magic to kill with any amount of joy, but it had provided her with some excellent rewards, such as her mundane weapon of choice. And it wasn’t like the world was going to miss one of the Hidden’s less magical lackeys. "Well met Adrienna! May our sharing of saliva seal our friendship for centuries, provided you humans live that long." Adrienna stood still, completely dumbstruck. Asuka had licked her. And not in any kind of sensual or romantic way either, which would not necessary have been unwelcome. No, like a dog. It was going to be a long voyage. True, the strange woman had the potential to be hilarious, but... Licked. On the face. Like a dog. She barely registered Asuka's request to be worshipped, but the continued conversation caused her to abruptly turn on her heel. "It was lovely meeting you both, I need to...." She trailed off, gesturing wildly in the direction of Tenebra and Brackenburn, before marching over to them. Please be sane, please be sane. "Absolutely not, for you see I am not ordinary! Why, I would go so far as to say that I am exceptional! I, my fair fat man, am a goddess! Please try to contain your enthusiasm. Instead, focus your energy instead into worshiping me. I will bring you all a lifetime of eternal happiness!" "Oh gods," Gisburn thought "we are traveling with an Insane Woman. And I thought that those Northerners from the Water Goat Escapade were crazy." "And all I need in return is your unquestioning loyalty. So feel free to bow people! You can just nod your head if bowing is too hard." "Greetings...er...goddess. I am Sir Gisburn of Pikeston, though you can call me Guy if you wish." He would have to watch his step with this one. Who knew what she could do if provoked.